Sounds unlikely? Our focus is quality in processes through learning, methodology and cooperation. Dive into our website and learn more about our expertise. Storm - The House of Six Sigma helps you to manage the internal organization needed to deliver the right quality, quantity and on time! You can participate in our open Lean Six Sigma training or in your company and get established internal training programs tailored to your needs and situation. With Storm – House of Six Sigma, you get access to the most comprehensive Lean Six Sigma training program in Denmark! We are the total supplier in the field - see some of our happy students. Bisca has worked closely together with Storm both in relation to Six Sigma and belts in all colors and in a large systematic effort to use acquired skills in practice. The latter has resulted in improvements in the millions. Storm has managed in the most exemplary way to adapt, challenge and raise the skills of employees at all levels. The most amazing thing is that they are passionate about Bisca as if it was their ‘own’, and the commitment and presence is contagious, so that everyone around them is getting better and provide far above level. I have experienced Storm - House of Six Sigma as competent teachers, who not only teach but work with the method in everyday life. They show genuine interest in the course participants' projects, and you feel in good hands. And it is nice that it is possible to combine sparring between modules with the possibility of "just" using the house as a free space to sit and work so that you can focus on the project. In connection with my Black Belt certification, I have through training and sparring been in contact with a number of amazing people in Storm, all with good humor, professionalism and the ability to see solutions as common denominator. If you are looking for a good and developing progress in the Six Sigma world, I can highly recommend Storm as a pathfinder. It has been by far the best, most interesting and rewarding education I have ever been to. And then you have to thank for a fantastic course with good and genius teachers. Do you need competent help to solve an urgent quality challenge or improve a project so you can maintain levels or remain competitive? We can facilitate the difficult meetings, map out the complicated processes, analyze cause of large, inconceivable data sets to find the cause of quality errors and offer quality management support in the management team. In short, we can assist you in all areas concerning quality management and management. Storm – House of Six Sigma gives access to highly skilled and talented specialists who are trustful at any level in your organization ranging from production, specialist to management. No tasks are too small or too big. Not even if the Headquarter of your company is in Jutland – where many of our customers are located. We are educating you to become a practitioner, who will be able to solve and crack real challenges. At Storm – House Of Six Sigma you can be educated at all Lean Six Sigma levels. You will get access to the most extended Lean Six Sigma education program in Denmark. We are a total supplier. You can participate in our open Lean Six Sigma education, in your company or get tailored our open Lean Six Sigma educations for your internal needs and situation. All the way through from project selection till certification you are going to be fully supported and guided in choosing the right decisions – without the expensive errors. We are here to support you! 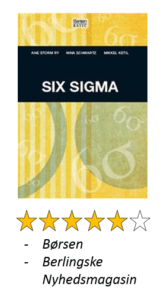 We have written a textbook about Six Sigma in Danish, that gives you an thorough and easy understanding of the Six Sigma method. We are proud of our book - so proud, that you can download the first chapter 'Six Sigma i et større perspektiv' for free. You can also buy the book as iBook.